Glutone Face Wash is made with Dermawhite a unique blend of skin lightening ingredients such as Saxifrage, Papaya and Guava. A : Must buy product didn't c any difference in lightening yet as I have used only for 10 days but blindly go for this face wash guys ....,,,???? A : . Doesn't matter age group. U have apply this Facewash of any age. A : I think anyone above the age of 18 years can use this..
A : every adult person can use this face wash.
A : I think it is good for all ages except children. Q : Is it foaming or not??? A : Yes it is foaming.but not like regular facewahes.we need bit more to create foam.its a great product to save our skin.it takes time for whitening. A : Gluton forms foam to some extent.I have been using it only for a few days. A : Yes it is foaming but less than other face wash.
A : It's is a good product.iam getting a good result! A : Fash wash is amazing i have been using since from one week...its good I like it!!!! A : Yes it is highly foaming. You just need to take a small amount onto your palms an rub it to lather up. The facewash is really good. Q : Is that sulphate parabin mineral free? A : It's amazing. I Luv it and recommended to all my relatives . A : Yes, it is..
A : Very good product. Ye ek buhut hi acha face wash he. A : Yes lt is . A : good solution for a black skin peoples. A : Yes! It's completely safe to use. Q : I have sensitive skin +oil skin+pimple and dark spot. Can I use this product? A : For sensitive skin I would suggest you to ask a dermatologist n use it, its good for oily skin people. Since its been my first purchase n been only 3 days of its use, I can't say anything but so far I like it. Makes my skin soft n clean. A : Yes.I have also oily skin.I use it regularly twice a day. A : Yes it is a very good product ..I have just started using it. I am finding good soothing skin after every use. A : My opinion is yes mainly depends up on the skin. this product gives a good result! Even I have dark spots and pimples on my face. When I started using this product my skin became soft and pimples are also reducing! A : Sure bro, its also really sensitive and controls oil. You can use it for sure no doubts . A : Awsm face wash it's really help me to getting a healthy and glowing face in just a week. A : Yes you can use this.. This face wash suits all skin types because my mom and I are using this though we have different skin types.. it doesn't irritate the skin. Gently cleanses the dirt, sweat and sebum. A : Natural skin ko restore krne m help krega yh ..
A : Yes of course. It is a magical face wash for skin whitening. You must try then you sms me. I ensure u that it will help to lighten ur skin colour whitout any skin damages or irritations. A : We need patients to see the improvement from this face wash around 2 to 3 months. A : Haan padega ..
A : It will help you to improve your complexion but it will not make you fair, if ur skin color is natural respect that or if your skin is tanned due to exposure it will help you to get back your skinn color & complexion. A : Using this Product From last 5 days and positive Results are found in Just 5 days, this is Useful for all skin Problems. And yes i found this Useful for suntan too. A : Yes...you can use this regularly to make a difference. A : Yes, within 7 days of usage of Glutone as per instructions result will be visible. Q : Is this helpful in pore minimising? I am 21 i have larged visible pores so, should i need to use ghis this? Is this helpful for my problem ? A : Yes! It's gives good result,even I have pores along with pimples I am using this from 3weeks ,giving a good result. A : No it's not suitable for ur problem.Go for multani mud pack ull get benefitted by it. Q : Can men get affect from this face wash? A : My face not has pimples and after using this no pimples faced on my face. A : Yes u can use in all seasons...n it's results are awesome...m using this face wash since 1 month n definenetly u can also see the changes in ur skin tone..my dark spot fade out. A : Best Facewash Ever Used. A : Yes you can use it in both seasons winter and summer. It makes your skin smooth and oil free. I'm also using it. A : I don't know about marks but yes in my case pimples are getting reduced. The skin feels a bit tight in winter after washing with this face wash.
A : Meri personal experience se bol rahi hun, mera bhi skin bahut hi Jada sensitive hai I have used a lot different kind of face wash recommended by doctor but I glutone is one of the best I have ever used. Aft using it skin start glowing a lot and from the first day use you can differentiate the results. A : yes,, aap use kr skty ho even mere bhi sensitive skin and i am using it .., and i am not seeing any sideeffects . Q : Can it remove dark spots like melasma? 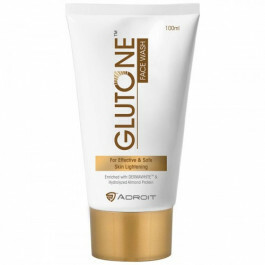 A : Glutone Face Wash is suitable for all skin types. A : Yes! It is suitable for all skin types. Q : Does it work like glutone 1000? A : Obviously not that’s an anti-oxidant supplement and this is skin lightening face wash.
Q : Is it worth 300 rupees? A : 1 hafta use karke accha aur worth lag raha hai. Q : What is dermawhite? Q : Kya ye sabhi skin type ke liye suitable hai? Q : Iska texture kaisa hey? A : Yes! It is suitable for all skin types including Dry Skin. A : Thank You for your feedback. Stay Tuned for updates. Q : Kya ismey bhi setria glutathione hey? Q : Is it suitable for sensitive skin? I have sensitive skin? Is it safe to use? Q : Hello, my skin is oily and acne prone skin, so will it suit me?? Q : Which moisturizer cream we can use after applying glutone face wash? Many problem 1 solution, this is the best face wash i have ever used???? Yes! It is suitable for all skin types including Dry Skin. Thank You for your feedback. Stay Tuned for updates. Glutone Face Wash is suitable for all skin types. Yes! It is suitable for all skin types. Hello, my skin is oily and acne prone skin, so will it suit me?? Which moisturizer cream we can use after applying glutone face wash? I have sensitive skin +oil skin+pimple and dark spot. Can I use this product? Does it work like glutone 1000? Obviously not that’s an anti-oxidant supplement and this is skin lightening face wash.
Is it worth 300 rupees? 1 hafta use karke accha aur worth lag raha hai. Kya ismey bhi setria glutathione hey? Kya ye sabhi skin type ke liye suitable hai? Meri personal experience se bol rahi hun, mera bhi skin bahut hi Jada sensitive hai I have used a lot different kind of face wash recommended by doctor but I glutone is one of the best I have ever used. Aft using it skin start glowing a lot and from the first day use you can differentiate the results. yes,, aap use kr skty ho even mere bhi sensitive skin and i am using it .., and i am not seeing any sideeffects . Can it remove dark spots like melasma? Can men get affect from this face wash? Natural skin ko restore krne m help krega yh .. Yes of course. It is a magical face wash for skin whitening. You must try then you sms me. I ensure u that it will help to lighten ur skin colour whitout any skin damages or irritations. We need patients to see the improvement from this face wash around 2 to 3 months. It will help you to improve your complexion but it will not make you fair, if ur skin color is natural respect that or if your skin is tanned due to exposure it will help you to get back your skinn color & complexion. Using this Product From last 5 days and positive Results are found in Just 5 days, this is Useful for all skin Problems. And yes i found this Useful for suntan too. Yes...you can use this regularly to make a difference. Yes, within 7 days of usage of Glutone as per instructions result will be visible. Must buy product didn't c any difference in lightening yet as I have used only for 10 days but blindly go for this face wash guys ....,,,????
. Doesn't matter age group. U have apply this Facewash of any age. I think anyone above the age of 18 years can use this..
every adult person can use this face wash. I think it is good for all ages except children. For sensitive skin I would suggest you to ask a dermatologist n use it, its good for oily skin people. Since its been my first purchase n been only 3 days of its use, I can't say anything but so far I like it. Makes my skin soft n clean. Yes.I have also oily skin.I use it regularly twice a day. Yes it is a very good product ..I have just started using it. I am finding good soothing skin after every use. My opinion is yes mainly depends up on the skin. this product gives a good result! Even I have dark spots and pimples on my face. When I started using this product my skin became soft and pimples are also reducing! Sure bro, its also really sensitive and controls oil. You can use it for sure no doubts . Awsm face wash it's really help me to getting a healthy and glowing face in just a week. Yes you can use this.. This face wash suits all skin types because my mom and I are using this though we have different skin types.. it doesn't irritate the skin. Gently cleanses the dirt, sweat and sebum. Is it foaming or not??? Yes it is foaming.but not like regular facewahes.we need bit more to create foam.its a great product to save our skin.it takes time for whitening. Gluton forms foam to some extent.I have been using it only for a few days. Yes it is foaming but less than other face wash. It's is a good product.iam getting a good result! Fash wash is amazing i have been using since from one week...its good I like it!!!! Yes it is highly foaming. You just need to take a small amount onto your palms an rub it to lather up. The facewash is really good. Is that sulphate parabin mineral free? It's amazing. I Luv it and recommended to all my relatives . Very good product. Ye ek buhut hi acha face wash he. good solution for a black skin peoples. Yes! It's completely safe to use. Is this helpful in pore minimising? I am 21 i have larged visible pores so, should i need to use ghis this? Is this helpful for my problem ? Yes! It's gives good result,even I have pores along with pimples I am using this from 3weeks ,giving a good result. No it's not suitable for ur problem.Go for multani mud pack ull get benefitted by it. My face not has pimples and after using this no pimples faced on my face. Yes u can use in all seasons...n it's results are awesome...m using this face wash since 1 month n definenetly u can also see the changes in ur skin tone..my dark spot fade out. Yes you can use it in both seasons winter and summer. It makes your skin smooth and oil free. I'm also using it. I don't know about marks but yes in my case pimples are getting reduced. The skin feels a bit tight in winter after washing with this face wash.
Is it suitable for sensitive skin? I have sensitive skin? Is it safe to use?